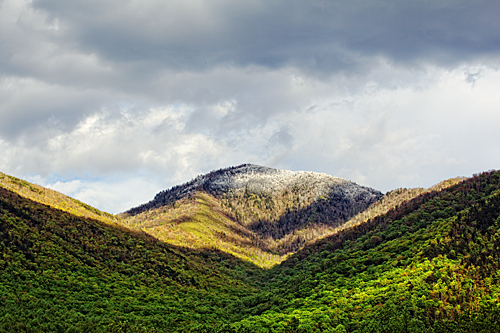 On Monday, April 23 on the first full day of the Smokey Mountain workshop there was rime ice that made the narrow winding switchbacks mountain roads to Clingmans dome too treacherous for driving and the road was closed for most of the day. 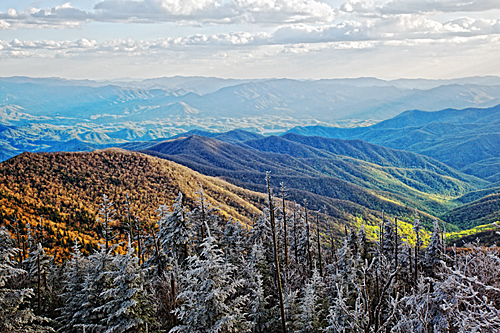 Fortunately after 4pm the road to Clingmans dome was reopened and we were able to capture some fabulous images. I have traveled through the Smokey mountains for the last 20 years on my way home from the southern art fair circuited and this is the first I was able to capture Rime Ice sometimes known as hoar frost. The summit of Mount Le Conte to the east of 441 was covered in rime ice. Sunlight played on the landscape like a painters brush as it dappled the trees on the mountain with light as we photographed. It is always a wonderful experience watching when nature presents us with her handiwork. This entry was posted on Monday, April 30th, 2012 at 6:54 pm	and tagged with Charleston Spring Photo workshop, Nik Software, Photoshop training and posted in Adobe CS5.5, Clingmans dome, Hoar Frost, Mount Le Conte, Nik Software, Photographic Workshops, Rime Ice, Smokey Mountain Photo Workshop, Smokey Mountain Photographic Workshop, Smokies, Uncategorized. You can follow any responses to this entry through the RSS 2.0 feed.